The Cerakote coated full 1/4" thick D2 tool steel full tang drop point blade features a main flat grind with a thick secondary swedge for maximum toughness and piercing ability. 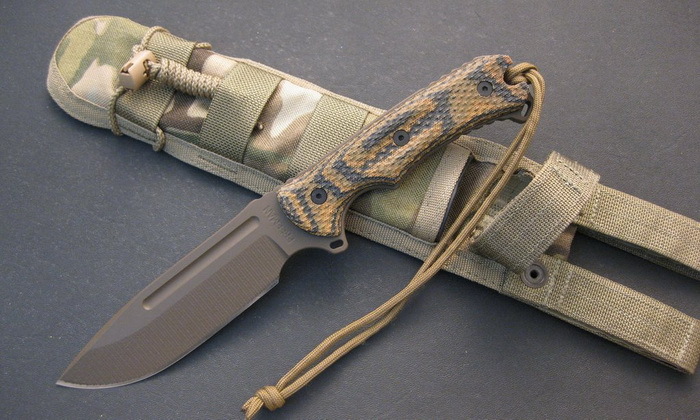 This particular knife is as shown in the photo with Flat Dark Earth Cerakote, Camo G-10 and Spec-Ops Multicam Sheath. Sheath: Spec-Ops Brand Combat Master Sheath Note: Sheaths have a thermo-formed insert and are fitted for right-side carry. If you would prefer a left-side carry, just add that into the notes during check-out. I’ve had “value” products fail in the field and have felt the anger and sometimes the despair that comes from this. My goal with every product I design and build is to make this a non-issue. Outdoor gear should be made to withstand the environments and tasks for which it was intended. Period. I think this is self-evident but it bears repeating. My design philosophy is this: make the product solve a problem, don’t just make it look “cool”. If you can solve the user’s needs while at the same time making it look cool, then all the better. Make things that are proven and refine them through field testing. Make things that you are proud to own and use. Make things that you would be proud to give as gifts or to hand down to your children. Make things that will last for generations. If you want to buy something that you will use unfailingly for years, something that you can hand down to your kids, something that will be used for generations, then first do your research. Educate yourself on proper materials, construction and use for the given implement. Look into the background, knowledge and qualifications of the gear designer, maker or manufacturer. Do this with a critical mindset, as if you were interviewing them for a job. For product shapes and ergonomics, find out hands-on what you like and discard what you don’t. Read or watch relevant and professional gear reviews on the web. Ask trusted friends what they use and why. Find, select and purchase a quality made product that will do what you need it to do year after year without fail. You’ll be glad you did.